I read a post yesterday, that I found through a colleague of mine, Picture Perfect Organizing. (Thanks Jody) and if you have been reading this blog for a long time, you know that my big organizing downfall is photos. I just can’t seem to find the same passion organizing photos than I do with other things. Even my own photos sit languishing in the corner (unorganized) as we speak. But . . . to get back to the post I read. It was from Capturing Joy and had great examples of ways to display photos in your home using black and white photography. I love to do this. So I thought I would share two spaces in my home where I have done this. First, this is my dining room. This wall started with the family tree that I made for my husband many years ago. Then I decided to add photos of the many relatives who made up our tree. Mind you, I started this before scanners and email, by asking our parents if I could make copies of some of the old family photographs. I reproduced each photo in black and white and some I changed the size of the photos as well. 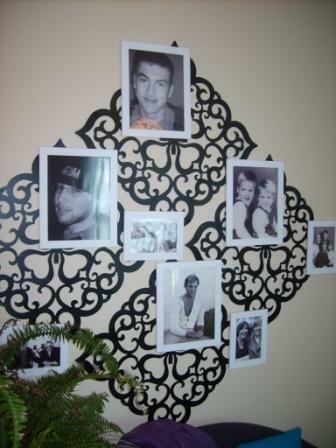 To make them cohesive, everything is framed in black frames and white mats are used in some frames. 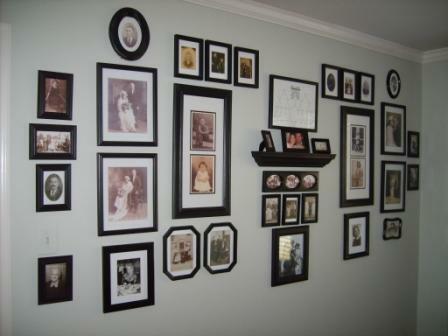 I also have all the photos arranged by family – Mom, Dad, Mother-in-law and Father-in-law, but you don’t have to do this. Second, is a project I just started. It’s on a wall in my office. You see, as the year’s have gone by and my children have grown, for some reason I slowly put away all the photos of them when they were young. I started to think that it looked cluttered and was somewhat a source of embarrassment to them. (I do have a digital frame with lots of those early years, so I don’t miss out.) The wall in my office is some of the favorites of mine. I like looking at them daily. The black graphic design is from The Container Store. They are just so fun, I had to have it. To simplify I decided to use white frames from IKEA – Simple and Cheap! I am still adding to the wall. How do you display your favorite photos in your home? This entry was posted in Residential Organizing and tagged Collections, Displaying Collections. Shelves, Displaying Photos, DIY, Photo Organizing. Bookmark the permalink.